Ristar was recently added as a cameo character for the game "Sonic and Sega All Stars Racing". Sumo has been responding to fan input, so as a result Ristar made it into the game in some form. I've been pondering a vehicle design for Ristar for a while, if he were a racer, finally put it down on paper. Drawing is mostly marker, some PS retouching has been done. I can only 'wish' for this to be true. (pun intended XD) 10/10 I love your design. Man,this car are so amazing...I want to drive this! They may have a point on that, but I still love it. Better than Sonic I'll tell you that! That would've been awesome, although he looks like he's ready for Sonic Drift 2. Notice: mikaRISTAR ... I just had to. he'd be great as a DLC character. There's a poll going on at the moment for DLC Characters in Sonic & All Star Racing Transformed. 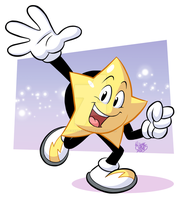 We need to get Ristar to 1,000 votes for him to be considered. maybe in the next Sega All Stars/Superstars game, he can be playable. I’m really hoping that Ristar appears as a playable racer in Transformed. But what I’m wondering is, if he is going to be playable in Transformed, what would his All-Star Move be? We'll most likely see Ristae in the sequel later this year! If only he was playable. The game seems to have more characters from Dreamcast games than from Genesis console. At least Alex Kidd was playable. Before Sonic, he was SEGA's first mascot. They could've done the same thing to Ristar. After all, he is the prototype of Sonic. Anyways, the design of Ristar's car looks awesome. I like it! Well done. But the back feels kinda "empty", though. This is a great concept piece!! Fantastic ! Juste made me even more fan of the cutest shooting star ever ! Ristar is Pimpin his awesome Car! I was so disappointed when he wasn't in the game, but at least he made a cameo in some later DLC. Go Ristar! That's awesome. I would have bought the game if he was playable. awsome, just really awsome. I really wanted Ristar for this Game. Let me just say this pal! Top-notch car design, but... I think it needs a bit more decoration on the back. It's looking pretty bland there and after all that's where players would be looking most of the time. Also I think his car should be more of a neon sparkly hovercraft but that's just me. Any chance you'll be doing more of these? True, the rear of the car isn't fully fleshed out; I neglected the tail-lights, for one thing. Otherwise I came up with an idea for NiGHTS which I haven't posted here.. it's him as a jet with Claris and Elliot in a dual cockpit. A sparkly hovercraft idea would work for Ristar, I'd agree. I'd honestly prefer it were Nights just by himself in a cool-looking vehicle. You could use his stretchy amrs to grab on to other players' cars! XD Slow em down! This is a really thought out design as well. The primary colors fit really well with the design.